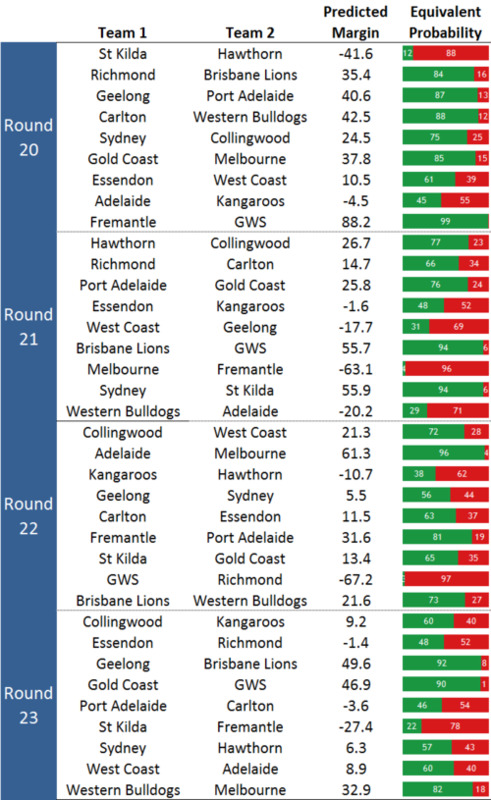 Round 19 had a lot to say about which teams would finish where in season 2013. That's the conclusion you'd be inexorably drawn to to if you reviewed the latest MAFL simulations - and, you'd hold similar views if you looked at the latest TAB Sportsbet markets, which currently exist only for the minor premiership. But, not for the first time, I'm getting a little ahead of myself (whatever that means). So, firstly, here are the margin predictions on which I'm basing the latest simulations. The Predicted Margins shown are based on the equation that I provided a few weeks back, and the Equivalent Probability data is predicated on the assumption that the final game margin is Normally distributed with a mean equal to the Predicted Margin and with a standard deviation of 36 points. From this you can see, for example, that many of the upcoming rounds' games appear to be near foregone conclusions, with expected victory margins of 4 goals or more and, consequently, assessed likelihoods (does that word have a plural?) of victory exceeding 75%. In fact, over the course of the remaining four home-and-away rounds, only eight games have predicted margins of single digit magnitude, and five of those come in the last round of the season (which, frankly, are likely to be about as predictable right now as the decay of a radioactive particle). Anyway, if we use the Predicted Margins shown here as the basis for our usual series of 10,000 simulations, we wind up with the following density diagram. 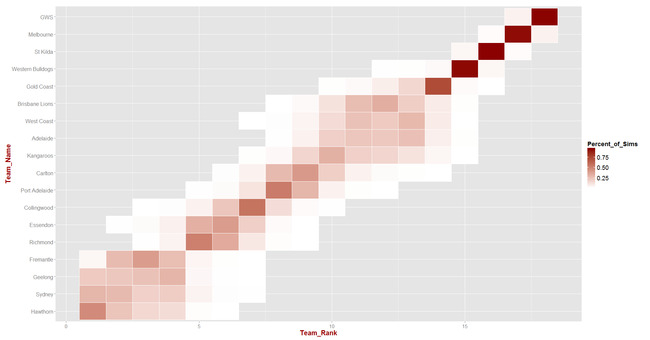 The fact that only a few bars are shown for each team and that the height of one or two predominates underscores the reality that the final ladder positions for most teams are now all-but determined. That fact is made even more apparent by the heat map, which for many teams now burns brightly red. 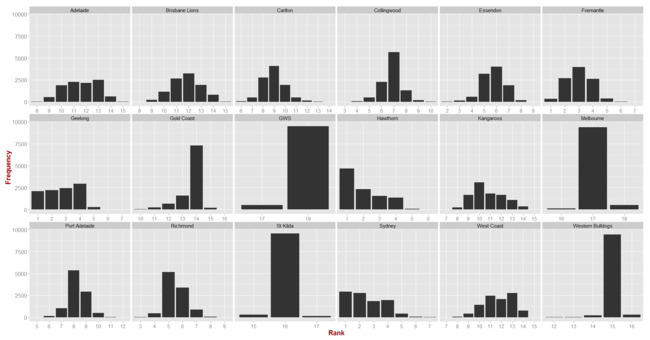 Richmond are most likely to finish 5th, Essendon 6th, Collingwood 7th, and Port Adelaide 8th. Then, narrowly missing out on the finals, the simulations have Carlton finishing 9th and the Roos 10th. At the foot of the ladder we have Gold Coast as good things for 14th, the Dogs for 15th, St Kilda for 16th, Melbourne for 17th, and GWS for 18th, with Adelaide, West Coast and the Brisbane Lions tipped to fight over positions 11th through 13th. Focussing solely on the ladder positions that matter and comparing teams' current projected simulated finishes with those after Round 18, we see that the most recent results served to mildly enhance the chances of Fremantle, Geelong or Sydney of taking out the minor premiership; to significantly reduce Essendon's, and mildly enhance Fremantle's and Richmond's chances of a Top 4 finish; and to significantly reduce Carlton's, and mildly increase Collingwood's, the Roos' and Port Adelaide's chances of a Finals berth. 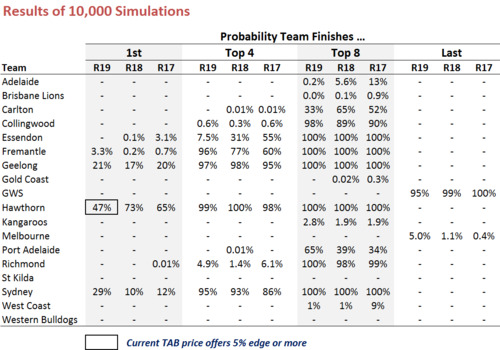 As noted earlier, the TAB Sportsbet bookmaker is currently fielding a relevant market only for the eventual minor premier, on which the Hawks remain as the only value bet at $2.50 based on their simulation-assessed probability of 47%.